Many of us who were fortunate to play baseball at high levels (HS, College, Pro) find ourselves back on the smaller diamond coaching our kids' teams. Before we get started we first want to recognize that this is a different game than the one we once played. First, these are little kids, not teens or grown men. Their bodies are not as strong as our are - or were :) ...and their vocabularies and ability to grasp deep concepts are limited. We want to catch ourselves when we ask them to perform physical actions their bodies are not ready for, while we want to be sure the terminology we use can be grasped by our youth baseball and softball players. For example: we want them to let the pitch come to a point where they can contact the ball with maximum strength. Likely we will say, "Let the ball travel", or "Let the ball get deep". ...travel where? ...get deep relative to what? These statements can easily go right over a kid's head. Another way to communicate the same thing while coaching is saying, "Let the ball get to your feet". We know that contact is made, give or take, even with the front foot ..with some variation on inside and outside pitches. No need for the catcher to run down the line with the batter - at most parks (urban one's for sure) the perimeter fence is only 20'-25' beyond the base. The pitcher breaks for third on balls hit to the left side of the infield - at this level we have runners on first and second a lot. These runners are not that fast. Double plays are rarely turned. Getting an out, any out is a big deal. Training our pitcher to break for third, and practicing feeds from the third baseman and shortstop to third base will result in a lot of 5-1 outs, a few 6-1 plays over the course of the season. We also train our pitchers that, when they field a ball that takes them to the third base side of the rubber to feed the third baseman for a 1-5 put out. The second baseman covers first - when the first baseman in ranging to their right or coming in on a ground ball often the pitcher is also attempting to make a play on the ball, or is slow in getting off the rubber. Training the second baseman to cover the bag when not fielding the ball is important in youth baseball and softball. Often the pitcher is the best athlete on the field; we want them handling the ball as much as possible. Learning and execution is simplified when the pitcher is the cut-relay player on all plays to the plate. Kids play a variety of positions at this level; at the very least, they play positions other than pitcher. That fact, coupled with limited practice time we have at the youth level, results in kids not getting the reps needed learn the nuances of each position. Outfielders back-up bases on every play. Even at the 12 year old level the outfielder are not that far from the infield. When they are not chasing down balls in the outfield, they should be sprinting in to back up throws to bases ...they develop this habit through drill work, not by us simply telling them. If you are new to this level, you will soon find out how important it is to have every throw to a base to have player backing-up. The underhand toss is used a lot more often. The players are so much closer together on the small diamond. Also, there are many more base runners, setting up a lot of force outs. Given these two points, each game has many situations where a throw of 20' or less is in order. The kids need to be taught how to execute an underhand toss and it needs to be practiced a lot. Btw - you'll be shocked by the number of kids who don't know that toss the ball underhand is even an option. Base is for the Runner; Ball is for the Defense - Gather your team together near the third base coach's box, then stand at the third baseman's position. Point to home plate and the three bases, naming each base. Then point to third base and ask your players, "Who does that base belong to?". It is very likely that all of your players will say 'Its the third baseman's base'. In response, you walk over, stand on third base and ask them, "I am the third baseman. Am I safe?" After a moment of bewildered stares, ask them again if you are safe? Pause another moment, then ask them, "Who is the base for?" A moment later you'll hear in low sheepish tones, "its the runners base". Point made and one of the most important lessons is taught. A lesson that will change the play of your team the rest of the season. The base is for the runners!!! With this new perspective, we then tell our players, "The Base is for the Runners, The Ball is for The Defense. You need the ball before the base has any value to you." Any experienced will immediately have a vision come to mind from the statement, 'the base is a magnet'. Kids cover a base, stick their foot on the base, then when a throw that is off line approaches, streeeeeeeetch their body out as far as possible to reach for the ball, but gosh no, they are not pulling their foot off that base.......because they have a mindset that the base is something they need to stay in contact with. This is regardless of the base and the situation. We have a tag situation at home, but that catcher has their foot on the plate and are stretched out like a first baseman. At higher levels of baseball and softball, form which most kids take their cues on how the game is played, most outs are recorded at first, and in most circumstances we see the first baseman in a stretch position. Logically kids come to believe that the way to receive a throw at a base is with their foot on the base and in a stretch position. Positioning at the base to receive a throw - Many throws at the youth level of baseball and softball are off line, especially below the 11-12 year old level. At the teen, High School and higher levels of play players will straddle the base on force outs. I strongly suggest not teaching this technique or allowing it. The base has the same effect on a young player as when they put their foot on it. The base is a magnet. When a throw is line, the tendency of the player, when a throw is off line, is to stay at the base and reach sideways in hope of reaching the errant throw...often in vain. Given the inconsistency of throwing accuracy at the youth level, we want to have our players position themselves right next to the base, in a 'Ready Position' (feet wide, hands in front of their chest, like a basketball plaer playing defense, or a linebacker in football) prepared to move laterally to stop the ball when its off target. They stand next to the base, but are not in contact with the magnet. This frees them up to Move to the ball when it's off line. We teach our players to stand on the same side of the base the ball is coming from, but not in the path of the runner. in the rare case the throw is coming from a point directly behind the runner, we want the defensive player to stand on the side of the base that puts their glove hand between them and the base. This teaching detail can can be reserved for players at the 10 year old level and above. Positioning for a force out is slightly different. In this situation the defensive player starts in a Ready Position facing the ball, with their throwing hand foot's heel centered at the side of the base the ball is coming from, and a couple inches from the base. This is primarily in reference to taking a throw at first when the side of the base the ball is coming from is not in the path of the runner. When taking a throw on a force out at another base or home plate, the defensive player often would find themself in the path of the runner when standing on the side of the base the ball is coming from. In such case, the defensive player, in a Ready Position, positions the heel of one foot next to the corner of the base, with the other foot away from the path of the runner. This is where the common confusion of the 'stretch' position of taking a throw comes into play. It is not until the throw is in the air and the player sees that it will be accurate that they move into a stretch position. The teaching statement is, "Don't commit your feet until you see the ball". The problem in the misunderstanding of the 'stretch' position comes from the fact that, when watching a game, our eyes are following the ball and not the defensive player setting up to take the throw at the base (most often this is first base). We don't see that the player (often the first baseman), first sets up in a 'Ready Position'. Only after they recognize the throw is accurate, so they move into a stretch position. But the average fan, who is following the ball, only sees the player receiving the throw at the end of the play after they have already moved out of the Ready Position to a Stretch Position. “Cover the base with your eyes” - Kids are curious creatures. The actions of the game are dictated by where the ball is on the field its relationship to the defensive players and the the base runners. Given these facts, players on defense want to watch the ball. However, the infielders who are not making a play on the ball have higher priority regarding their defensive responsibilities - they need to cover a base. When coaching our team we want to constantly remind our infielders that if they aren't getting the ball, they need to cover a base. Covering a base properly means taking their eyes off the ball and directing their eyes to the base they are responsible for covering. We teach them to 'Cover the Base With Your Eyes'. This means staring at the base, while sprinting to it. Only after they arrive at the base do they turn around and face the ball in preparation for the possibility of receiving a throw. Look for other runners - In many teaching situations this phrase is taught as "look for the next play". When working with kids we want to structure our talk as literally as possible. When looking for the next play what are we looking for? We are looking to see if any of the other runners are trying to advance, and if they are, be prepared to make a throw. After making a play at a base, we want to train our players to immediately get into a Power Position, while Moving Their Feet towards the middle of the diamond. With this habit in place, when there is a time that another runner is trying to advance, our players are prepared to throw and are moving towards the base they need to throw to (gaining ground toward the middle of the infield is moving a player closer to the other three bases). This section is dedicated to helping coaches teach kids their defensive responsibilities on each play regardless of where the ball is hit or where the runners are. The concepts laid out in this section can help us improve teaching kids 'how to play the game'. Before digging in, let's add something to the old coaching comment, "Be sure you know what to do if the ball is hit to you". But the ball is hit to one player; what about the other eight? We must also teach our players to, "Know what you are going to do when the ball is NOT hit to you". When the game is played properly each player on defense is moving (sprinting) the moment the ball comes off the bat. All nine players MOVE to get to their required spot on the field. Often, as the play evolves, and the ball moves around the field, some players will have to MOVE and re-position themselves as their responsibilities change. Most kids only consider the first option. We want to teach our players early on that they are not required to throw the ball in order to move it around the field. It is perfectly acceptable to carry the ball. Many young players do not recognize they have the option of carrying the ball to its destination. They believe that the ball is only moved by making a throw. It is important to point this out to our players very early in the year. When those times come up that a player is not sure what to do with the ball, the teaching is run with the ball straight for the pitching rubber. Each step closer to the middle of the diamond, the player with the ball becomes a greater threat to the base runners and they are that much more likely to not try advancing to the next base. When the ball is near the pitching rubber, the player with the ball is an equal, and significant, threat to all base runners. This is why the pitching rubber is the destination for a player who is not sure of what to do with the ball. While that player is heading toward the pitching rubber, they are assessing the the situation on the field. It is likely that while they are on the move, they will figure out where to throw the ball. At which time they can go ahead and make the throw. 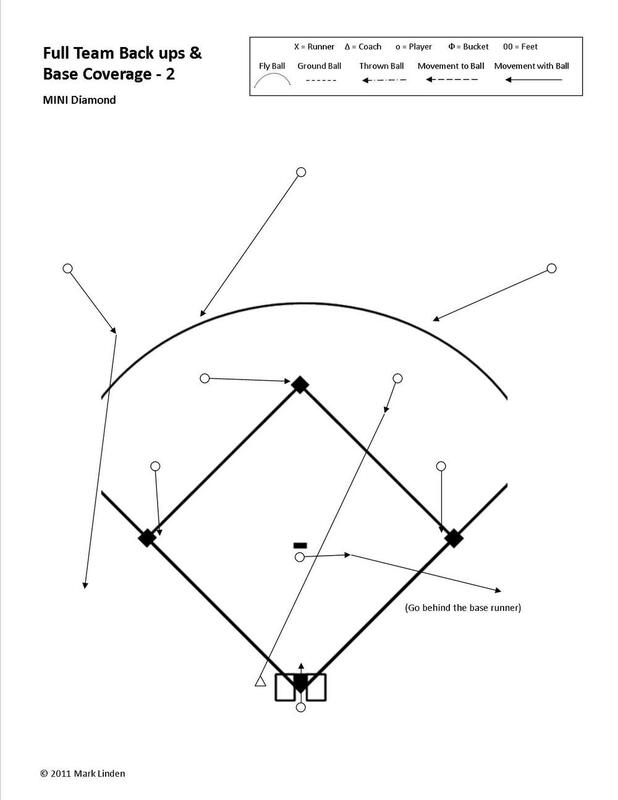 This throw has a better chance of being a good one because, as a result of moving the ball toward the middle of the diamond, they have shortened the distance required of the throw. As soon as a player has control of the ball they must immediately move the ball...throw it, or run with it towards the pitching rubber. ...No standing in one spot holding the ball. The catcher's position is one foot in front of home plate. The first day we work on team defense we want to explain that the catcher's position is Not behind home plate ...that is where a catcher receives pitches. Once the ball is put in play the catcher moves to their 'position', in front of home plate ...out on the field with their teammates. 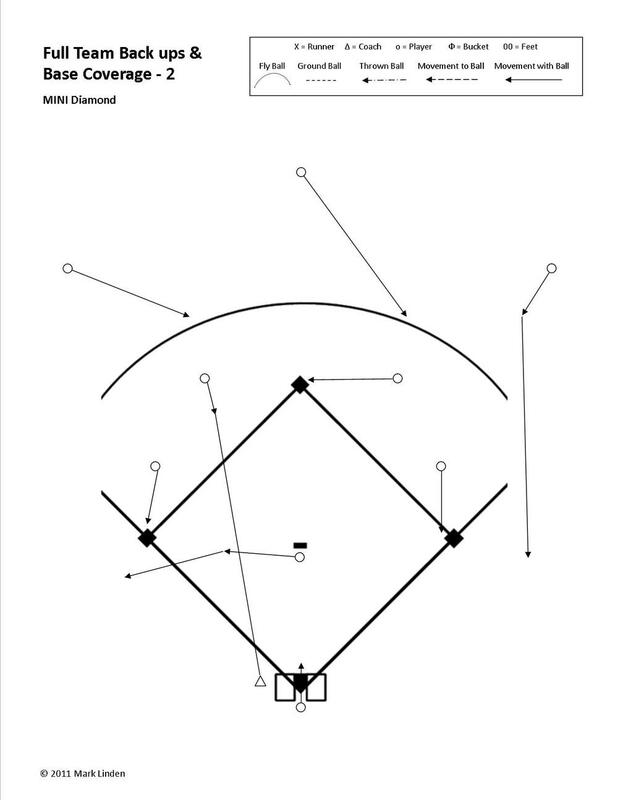 The Mini Diamond is also used to teach drills and plays before running them on the regular size field. Players are able to get many reps in a short period of time on the Mini Diamond. This more compact environment enable coaches to better communicate and teach. When players take the learning and habits established on the Mini Diamond to the regular sized field, their work can focus primarily on throwing, catching and timing. Regardless of level of play or the situation, each player on defense has one of three responsibilities: handle the BALL, cover a BASE, or BACK-Up a throw. Once the ball is fielded and moved to another point on the field, the responsibilities of some players change, while most have to reposition themselves in relationship to the ball's new location on the field. Early in the teaching process our objective is to train our players to correctly respond to where the ball is hit off the bat. As the season progresses we want to teach our players that their our positioning on the field in relationship to the bases and the ball changes each time the ball moves. That may be as subtle of a movement as a slight turn in order to keep their body facing the ball. It may be more dramatic as running 30'-40' to reestablish the straight line relationship from the ball to the base to them in their backing up of a base. Simple as this may seem, this is what the game is about. Stop the ball - this begins by establishing in the minds of our players (and constantly reinforcing) that they want to go get the ball and get it as quickly as possible. Stop the runners - the runners stop when they determine that further advancement might put them at risk of getting out. Quickly moving the ball closer to the runners helps them to determine its time to stop. The other way to stop a runner is to get the ball to the base ahead of the runner. Important note: when using a throw to move the ball into position to stop the runners, point #1 comes back into play. Often it requires a player backing up the throw in order to ultimately stop the ball (we'll address backing up soon). At the youth level of play, no defense is truly out of the woods until the ball arrives at the middle of the infield and is securely in the hands of the pitcher. It is critical to establish a mindset in our players that their defensive responsibilities do not end until the ball has arrived to the middle of the infield. We also want to establish a sense of urgency to get the ball to the middle of the infield as quickly as possible - every play. The old saying in baseball is, “Billy Bob, know what you are going to do with the ball if it is hit to you”. What is left out of this statement is the eight other players. Are we teaching them what to do when the ball is not hit to them? We first want to establish in our player’s minds that they are going to get every ball that is put into play. We teach them to think, “I am going to GO GET the ball” the moment it comes off the bat. Our objective is for each defensive player to make a hard, aggressive step towards the ball when it is put into play. This puts our player in motion. Once they are in motion it is easier for them to continue moving to the spot on the field where they are fulfilling their defensive responsibility. For most it will quickly be obvious that they aren't playing the ball, so they move to their next responsibility: cover a base or back up a base/throw. Center fielder: shortstop goes into the outfield “towards the ball”; the second baseman covers the base. NOTE: in the instance of a ball being hit to the catcher or pitcher, the shortstop and second baseman are still moving ‘towards’ the ball which has been hit in the space between the two positions. The same is true, in most instances, when the ball is hit to the center fielder. Whenever the ball is hit to one of these three players (catcher, pitcher, center fielder) the shortstop is the player in position to potentially handle the ball. Usually the shortstop is a better player than the second baseman and we want the more talented player handling the ball as much as possible. There will be the odd instances when the roles of the two players will be reversed. It would be difficult to go into too much detail here, but over time, and through experience playing and coaching the game, those exceptions to the rule will come up. There is no rule to determine when the second baseman takes over this responsibility. Over time, players will learn to recognize this situation. However this, and similar situations, lead to mistakes at all levels of play. * Most kids' idea of backing up a base is to stand five feet behind the base. It requires explaining to them over and over again that they need to be far enough beyond the base to have time to react to a poor throw. The distance we want them at is about 25' . Don't try to simply tell them this, or expect them to figure out how far 25' is; we have to move them to the correct distance and say, "See how far away you are right now? This is how far back you need to be in order to back up the base." And they won't get it ...you'll have to teach it over and over. But its worth the effort. Over throws a re a big part of the game at this level. Coaches that train their kids how to back up bases properly will see their team achieve a great level of success! Regardless of the situation, a potential force out or the need to apply a tag, the player stands on the side of the base the ball is coming from and not in the path of the runner. They stand in a Ready Position (feet square with the body, chest facing the player with the ball and hands in front of the body...picture a basketball player in a defensive position or the middle linebacker in football prior to the snap of the ball. We do not want our player touching the base prior to the ball being thrown and they establish the throw will be accurate. We do not want our player to straddle the base. In both instances the tendency of a young player, when a throw is off line, is to sty 'anchored' to the base, then making a desperate, and often unsuccessful, reach of the arm and glove to catch the ball. When a player is positioned 'next to' the base, there is a higher likelihood they will move away from the base to stop an offline throw. When the ball changes its position on the field, the player covering the base may have to change their positioning in relationship to the base. Example: a Thrid Baseman covering the base. Runners are on first base and second base, the batter hits a ball to the first baseman. The third baseman moves to the home plate side of the base, in a Ready Position facing the First Baseman. The First Baseman makes a throw to second base, but the ball is missed and heads out to left field. The Third Baseman then repositions themself to the left field side of third base and gets in a ready position facing the outfielder picking up the overthrown ball. Back-up throws to a base. If you aren't playing the Ball, cover your Base (Home Plate). Proper positioning is one foot in front of home plate. objective: All bases are covered on each play. Drill is run using a mini-diamond, approximately 20' - 24' square. When rolling the ball, call out which position the ball is going to, so their is no question of who is getting the ball and the other three infielders can react quickly to covering a base. When rolling to the corner infielders, only roll the ball about one third of the way to the base, so it is obvious that the base is open and needs to be covered by an infielder who is not playing the ball. The First and Third Basemen have one base they are responsible for; the Shortstop and Second Basemen have two bases they are responsible for; one to their Left and one to their Right. These two players, positioned in the middle of the field, follow this simple rule: If the ball is hit to your Left and you aren’t playing the ball, SPRINT to the base on your Left; If the ball is hit to your Right and you aren’t playing the ball, SPRINT to the base on your Right. The Pitcher is also in the middle of the field and is responsible for two bases as well: first base on their Left and third base on their Right. The Pitcher however, is not responsible for covering a base. The Pitcher is an ‘insurance policy’ in the event an infielder is unable to cover a base. The pitcher breaks towards the base on their Left or Right (depending on which side of them the ball is hit), they “Move Towards the Ball”. 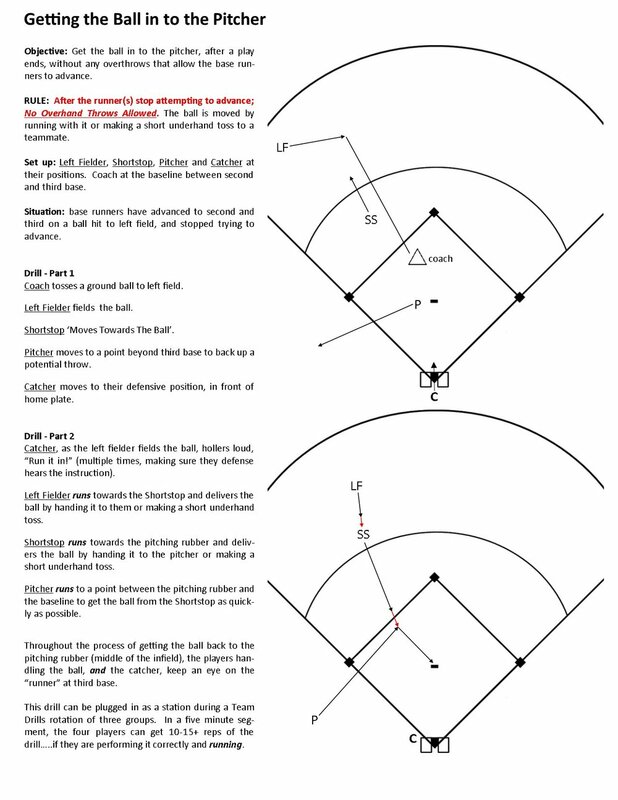 In this version of the drill the pitcher stops short of the base, so to not get in the way of the infielder covering the base, developing the habit of always breaking toward the base on their Left or their Right depending on which side of the infield the ball goes to. The Catcher also participates in this drill and has a responsibility to move. When the ball is delivered to the infield the Catcher leaves the spot where they receive pitches and move to their ‘Position’, which is in front of home plate. 2. When rolling a ball to an infielder, the coach calls out “ground ball to <position>”. This is important because on the Mini Diamond it is simple for more than one kid to go get the ball. 4. The three infielders not fielding the ball move quickly to their base, then turn and face the ball in a “Ready Position”. IMPORTANT NOTE: When delivering the ball to the first baseman or third baseman, only roll the ball about one third of the way toward the base. This forces the player to move far away from their base making it clear to the other infielders that it is not covered. When working on movement responsibilities this clear visual of an uncovered base helps the kids recognize where they are needed. NOTE: The rule of thumb, when the ball is hit to the center fielder, Pitcher or catcher, is the shortstop is positioned to handle the ball. The ball goes to cf, the ss goes out to get the ball; the second baseman covers the base. The BAll Goes to the P or c, the ss covers the base and the 2b backs up. Below are two examples of the movement of the entire defense moving based on where the ball is hit. The points in the 'Rules for Defensive Movement' section above are applied to these examples. After training our kids in these rules they will get to a point where most react more quickly and instinctively to where they are needed on the field in any given situation. These diagrams are provided less as a suggestion to run a drill with all nine players and more as a visual that a coach can use as a learning tool in preparation for teaching their players. The primary point to take from these two diagrams is that on ground balls on a given side of the infield the outfielder on that side of the field DOES NOT immediately take off to back up a base. Their first responsibility is to go for the ball, which means sprinting in behind the infielder attempting to field the ball. It is not until the ball is cleanly fielded and the outfielder is not needed that they look for a place to back up, which likely would be the a potential second or third throw of the play. Note: These diagrams are old and will be replaced at some point. Ignore the 'key' at the top. --> The rule for the other three infielders is to cover a base. --> The rule for the CF and RF is that because they are not playing the ball they are backing up a base. --> The rule for the Pitcher is "Always move towards the ball". In this case the Pitcher does not field the ball so they continue running in a straight line towards third base. They see the base is covered, so go to their next responsibility of backing-up the base. --> The rule for the LEFT FIELDER, because the ball is hit to an infielder in front of them, is to go for the ball. Not until they see the ball is caught by the fielder in front of them does their responsibility change to moving to back up a throw. In this case getting to the initial backing-up position is not a concern because the Pitcher is backing up third base. However, the Left Fielder does visually follow the ball and prepares for the possibility that the ball may be moved around the infield and they may be needed, later in the play, to back up a throw to second or third base. In this example we have a ball hit to the Second Baseman. --> The rule for the CF and LF is that because they are not playing the ball they are backing up a base. --> The rule for the Pitcher is "Always move towards the ball". In this case the Pitcher does not field the ball so they continue running in a straight line towards first base. They see the base is covered, so go to their next responsibility of backing-up the base. They need to be sure to go behind the base runner when crossing the base line. --> The rule for the RIGHT FIELDER, because the ball is hit to an infielder in front of them, is to go for the ball. Not until they see the ball is caught by the fielder in front of them does their responsibility change to moving to back up a throw. In this case getting to the initial backing-up position is not a concern because the Pitcher is backing up third base. However, the Right Fielder does visually follow the ball and prepares for the possibility that the ball may be moved around the infield and they may be needed, later in the play, to back up a throw to second or first base.